The Apollo–Soyuz Test Project (ASTP) (Russian: Экспериментальный полёт «Аполлон» – «Союз» (ЭПАС), Eksperimentalniy polyot Apollon-Soyuz, lit. "Experimental flight Apollo-Soyuz", commonly referred to by the Soviets as Soyuz-Apollo), conducted in July 1975, was the first joint U.S.–Soviet space flight, as a symbol of the policy of détente that the two superpowers were pursuing at the time. It involved the docking of an Apollo Command/Service Module and the Soviet Soyuz 19 capsule. The unnumbered Apollo vehicle was a surplus from the terminated Apollo program and the last one to fly. This mission ceremoniously marked the end of the Space Race that had begun in 1957 with the Sputnik launch. The mission included both joint and separate scientific experiments (including an engineered eclipse of the Sun by Apollo to allow Soyuz to take photographs of the solar corona), and provided useful engineering experience for future joint US–Russian space flights, such as the Shuttle–Mir Program and the International Space Station. ASTP was the last manned US space mission until the first Space Shuttle flight in April 1981. It was U.S. astronaut Donald "Deke" Slayton's only space flight. He was chosen as one of the original Mercury Seven astronauts in April 1959, but had been grounded until 1972 for medical reasons. It was the last space mission for Soviet cosmonaut Alexei Leonov, who had become the first person to walk in space during the March, 1965, Voskhod 2 mission. U.S. President Richard Nixon and Soviet Premier Alexei Kosygin (seated) sign an agreement paving the way for the Apollo–Soyuz flight, May 1972. The purpose and catalyst of the Apollo–Soyuz Test Project was the policy of détente between the two Cold War superpowers, the United States and the Soviet Union. Prior to this mission, tensions remained high between the two world superpowers while the United States was engaged in the Vietnam War. Meanwhile, the Soviet press was highly critical of the Apollo space missions, printing "the armed intrusion of the United States and Saigon puppets into Laos is a shameless trampling underfoot of international law" over a photograph of the Apollo 14 launch in 1971. Although Soviet leader Nikita Khrushchev made the Soviet Union's policy of détente official in his 1956 doctrine of peaceful coexistence at the 20th Congress of the Communist Party of the Soviet Union, the two nations seemed to be in perpetual conflict. After John Glenn's 1962 orbital flight, an exchange of letters between President John F. Kennedy and Soviet Premiere Nikita Khrushchev led to a series of discussions led by Dryden and Soviet scientist Anatoli Blagonravov. Their 1962 talks led to the Dryden-Blagonravov agreement, which was formalized in October of that year, the same time the two countries were in the midst of the Cuban Missile Crisis. The agreement was formally announced at the United Nations on December 5, 1962. It called for cooperation on the exchange of data from weather satellites, a study of the Earth's magnetic field, and joint tracking of the U.S. Echo II balloon satellite.. Unfortunately, as the competition between the two nation's manned space programs heated up, efforts to further cooperation at that point came to an end. 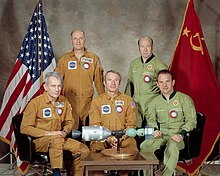 Due to tense relations, space cooperation between the United States and the Soviet Union was unlikely in the early 1970s. On June 7, 1971, the USSR had launched the first piloted orbital space station, Salyut 1. Meanwhile, the United States had launched the Apollo 14 mission several months prior, the third spacecraft to land humans on the Moon. Each side gave the other little coverage of their achievements. Both sides had severe criticisms of the other side's engineering. Soviet spacecraft were designed with automation in mind; the Lunokhod 1 and Luna 16 were both unmanned probes, and each Soyuz spacecraft had been designed to minimize risk due to human error by having fewer manual controls with which human operators would have to contend during flight. By contrast, the Apollo spacecraft was designed to be operated by humans and required highly trained astronauts in order to operate. The Soviet Union criticized the Apollo spacecraft as being "extremely complex and dangerous". The Americans also had their own concerns about Soviet spacecraft. Christopher C. Kraft, director of the Manned Spacecraft Center, criticized the design of the Soyuz: "We in NASA rely on redundant components—if an instrument fails during flight, our crews switch to another in an attempt to continue the mission. Each Soyuz component, however, is designed for a specific function; if one fails, the cosmonauts land as soon as possible. The Apollo vehicle also relied on astronaut piloting to a much greater extent than did the Soyuz machine". American and Soviet engineers already settled their differences for a possible docking of American and Soviet spacecraft in meetings between June and December 1971 in Houston and Moscow, including Bill Creasy's design of the Androgynous Peripheral Attach System between the two ships that would allow either to be active or passive during docking. With the close of the Vietnam War, relations between the United States and the USSR began to improve, as did the prognosis for a potential cooperative space mission. The Apollo–Soyuz Test Project was made possible by the thaw in these relations, and the project itself endeavored to amplify and solidify the improving relations between the United States and the Soviet Union. According to Soviet leader Leonid Brezhnev, "The Soviet and American spacemen will go up into outer space for the first major joint scientific experiment in the history of mankind. They know that from outer space our planet looks even more beautiful. It is big enough for us to live peacefully on it, but it is too small to be threatened by nuclear war". Thus, both sides recognized ASTP as a political act of peace. In October 1970, Soviet Academy of Sciences president Mstislav Keldysh responded to NASA Administrator Thomas O. Paine's letter proposing a cooperative space mission, and there was subsequently a meeting to discuss technical details. At a meeting in January 1970, U.S. President Richard Nixon's Foreign Policy Adviser Henry Kissinger enthusiastically espoused plans for the mission, and expressed these views to NASA administrator George M. Low: "As long as you stick to space, do anything you want to do. You are free to commit—in fact, I want you to tell your counterparts in Moscow that the President has sent you on this mission." By April 1972, both the United States and the USSR signed an Agreement Concerning Cooperation in the Exploration and Use of Outer Space for Peaceful Purposes, committing both the USSR and the United States to the launch of the Apollo–Soyuz Test Project in 1975. ASTP was particularly significant for the USSR's policy of keeping the details of their space program secret from the Soviet people and the world at large, especially Americans. The ASTP was the first Soviet space mission to be televised in a live fashion during the launch, while in space, and during the landing. Soyuz 19 was also the first Soviet spacecraft to which a foreign flight crew had access before flight; the Apollo crew were permitted to inspect it and the launch and crew training site, which was an unprecedented sharing of information with Americans about any Soviet space program. Not all reactions to ASTP were positive. Many Americans feared that ASTP was giving the USSR too much credit in their space program, putting them on equal footing with the sophisticated space exploration efforts of NASA. More feared that the apparent peaceful cooperation between the USSR and the United States would lull people into believing there was no conflict at all between the two superpowers. Soliciting appropriations from the United States Congress proved to be quite difficult, which was not a problem in the Soviet Union, and the dedication to space exploration demonstrated by the Soviet Union rejected these criticisms. Some Soviet publicists called American critics of the mission "demagogues who stand against scientific cooperation with the U.S.S.R." In general, tensions between the United States and the USSR had softened, and the project set a precedent for future cooperative projects in space. Jack Swigert had originally been assigned as the command module pilot for the ASTP prime crew, but prior to the official announcement he was removed as punishment for his involvement in the Apollo 15 postage stamp incident. A 1973 artist's conception of the docking of the two spacecraft. A Saturn IB launch vehicle lifts the American ASTP crew into orbit. A Soyuz-U launch vehicle lifts the Soviet crew into orbit. The ASTP entailed the docking of an American Apollo Command/Service Module (CSM) with a Soviet Soyuz 7K-TM spacecraft. Although the Soyuz was given a mission designation number (Soyuz 19) as part of the ongoing Soyuz program, its radio call sign was simply "Soyuz" for the duration of the joint mission. The Apollo mission was not a numbered mission of the Apollo program, and similarly bore the call sign "Apollo". Despite this, some of the press and a few NASA web pages have referred to the mission as "Apollo 18", but this should not be confused with the canceled lunar mission. The Apollo spacecraft was launched with a docking module specially designed to enable the two spacecraft to dock with each other, used only once for this mission. The Saturn IB launch vehicle and CSM were surplus material. Like the Apollo Lunar Module, the docking module had to be retrieved from the S-IVB upper-stage of the Saturn rocket after launch. The docking module was designed as both an airlock — as the Apollo was pressurized at about 5 psi (340 mbar) using pure oxygen, while the Soyuz used a nitrogen/oxygen atmosphere at sea level pressure (about 15 psi / 1000 mbar) — and an adapter, since the surplus Apollo hardware used for the ASTP mission was not equipped with the APAS docking collar jointly developed by NASA and the Soviet Academy of Sciences for the mission. One end of the docking module was attached to the Apollo using the same "probe-and-drogue" docking mechanism used on the Lunar Module and the Skylab space station, while its other end had the APAS docking collar, which Soyuz 19 carried in place of the standard Soyuz/Salyut system of the time. The APAS collar fitted onto Soyuz 19 was releasable, allowing the two spacecraft to separate in case of malfunction. The Apollo flew with a three-man crew on board: Tom Stafford, Vance Brand, and Deke Slayton. Stafford had already flown into space three times, including within eight miles of the lunar surface as Commander of Apollo 10, and was the first general officer to fly into space. Slayton was one of the original Mercury Seven astronauts selected in 1959, but an irregular heartbeat grounded him until 1972. He became head of NASA's astronaut office and, after a lengthy medical program, selected himself for this mission. At the time, Slayton was the oldest person to fly in space and the one with the longest gap between selection as an astronaut and first flight into space. Brand, meanwhile, had trained with the Apollo spacecraft during his time as a backup Apollo 15 command module pilot, and had served two stints as a backup Skylab commander. The closest he had come to flying prior to ASTP was as commander for the Skylab Rescue mission mustered to potentially retrieve the crew of Skylab 3 due to a fuel leak on that mission's Apollo CSM. The Soyuz flew with two men: Alexei Leonov and Valeri Kubasov. Leonov became the first man to walk in space on Voskhod 2 in 1965. Kubasov, who flew on Soyuz 6 in 1969, ran some of the earliest space manufacturing experiments. Both were to have flown on the ill-fated Soyuz 11 in 1971 (Leonov as commander, Kubasov as the flight engineer), but were grounded because Kubasov was suspected of having tuberculosis. The two-man crew on the Soyuz was a result of the modifications needed to allow the cosmonauts to wear the Sokol pressure suit during launch, docking, and reentry. 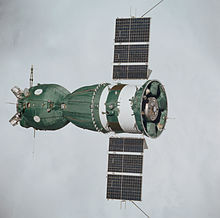 The ASTP-class Soyuz 7K-TM spacecraft used was a variation of the post-Soyuz 11 two-man design, with the batteries replaced by solar panels enabling "solo" flights (missions not docking to one of the Salyut space stations). It was designed to operate, during the docking phase, at a reduced nitrogen/oxygen pressure of 10.2 psi, allowing easier transfers between the Apollo and Soyuz. Six ASTP-class Soyuz spacecraft were built in total, including the one used. Before the actual mission, two craft were launched unmanned as Kosmos satellites. The third was launched as the manned Soyuz 16 flight as a rehearsal in order to test the APAS docking mechanism. Another craft was used fully fueled as a "hot backup" at the launch site – later it was disassembled. And the sixth craft was available as a "cold" backup; it was later used on the last "solo" Soyuz flight in 1976, but with the APAS docking adapter replaced by the MKF-6 multispectral camera. The Apollo spacecraft, as seen by the Soyuz crew. Mission control center in Houston during ASTP. U.S. President Gerald Ford speaks to the Soviet and American crews on July 18, 1975. The astronauts and cosmonauts assembled this commemorative plaque in orbit as a symbol of the international cooperation. The Soyuz and Apollo flights launched within seven-and-a-half hours of each other on July 15, and docked on July 17. 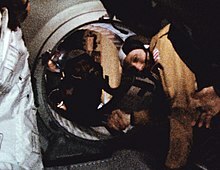 Three hours later, the two mission commanders, Stafford and Leonov, exchanged the first international handshake in space through the open hatch of the Soyuz. NASA had calculated that the historic handshake would have taken place over the British seaside resort of Bognor Regis, but a delay resulted in its occurrence being over the city of Metz in France. During the first crew exchange, the crews were read a statement from Soviet Premier Leonid Brezhnev, and received a phone call from U.S. President Gerald Ford. While the two ships were docked, the three Americans and two Soviets conducted joint scientific experiments, exchanged flags and gifts (including tree seeds which were later planted in the two countries), signed certificates, visited each other's ships, ate together, and conversed in each other's languages. (Because of Stafford's pronounced drawl when speaking Russian, Leonov later joked that there were three languages spoken on the mission: Russian, English, and "Oklahomski.") There were also docking and redocking maneuvers, during which the two spacecraft reversed roles and the Soyuz became the "active" ship. American scientists developed four of the experiments performed during the mission. Embryologist Jane Oppenheimer analyzed the effects of weightlessness on fish eggs at various stages of development. After 44 hours together, the two ships separated, and maneuvered to use the Apollo to create an artificial solar eclipse to allow the crew of the Soyuz to take photographs of the solar corona. Another brief docking was made before the ships went their separate ways. The Soviets remained in space for two more days, and the Americans for five, during which the Apollo crew also conducted Earth observation experiments. The mission was considered a great success, both technically and as a public-relations exercise for both nations. The only serious problem was during reentry and splashdown of the Apollo craft, during which the crew were accidentally exposed to toxic hydrazine and nitrogen tetroxide fumes, caused by unignited reaction control system (RCS) hypergolic propellants venting from the spacecraft and reentering a cabin air intake. The RCS was inadvertently left on during descent, and the toxic fumes were sucked into the spacecraft as it drew in outside air. Brand briefly lost consciousness, while Stafford retrieved emergency oxygen masks, put one on Brand, and gave one to Slayton. The three astronauts were hospitalized for two weeks in Honolulu. Brand took responsibility for the mishap; because of high noise levels in the cabin during reentry, he believes he was unable to hear Stafford call off one item of the reentry checklist, the closure of two switches which would have automatically shut off the RCS and initiated drogue parachute deployment. These procedures were manually performed later than usual, allowing the ingestion of the propellant fumes through the ventilation system. The ASTP was the final flight of an Apollo spacecraft. Immediately after the launch of the Apollo spacecraft, preparations began to convert Launch Pad 39B and the Vehicle Assembly Building at Kennedy Space Center for use by the Space Shuttle, the United States' next manned spacecraft program. Launch Pad 39A had already been closed after the launch of Skylab. A derivative (but mechanically incompatible) docking collar, APAS-89 was launched as part of the Kristall module of the Soviet Mir space station. Originally intended as the docking port for the (defunct) Buran Soviet space shuttle, the APAS-89 unit was used for the next Russian-American docking mission, STS-71, twenty years later as part of the Shuttle–Mir Program (though not before the docking port was tested by the last APAS-equipped Soyuz, TM-16, in 1993). The American Space Shuttle continued to use the same APAS-89 docking hardware through the end of the Space Shuttle program to dock to Mir and then the International Space Station, the latter through the Pressurized Mating Adapters (PMAs). The PMAs are equipped with the later APAS-95 adapters, which differ from the APAS-89 adapters in that they are no longer androgynous; while compatible with the APAS-89 docking collars, they are not capable of acting as the "active" partner in docking. The first PMA, PMA-1, remains in use as the interface connecting the Russian-built, NASA-owned Zarya module to the US segment of the ISS, and so the APAS continues in use to this day. The Apollo–Soyuz Test Project was the first joint US-Soviet space mission. At the time it was thought that space would become either more international or competitive as a result, however instead it became both. The mission became symbolic of each countries goals of scientific cooperation, while their individual news reports downplayed the technical prowess of the other. Soviet press implied that it was leading the US in space flight, tying it to Marxist ideology, while the US reported that the Soyuz was technically primitive. High-profile space cooperation declined after the successful mission and became entangled in linkage politics, however it set a precedent of cooperation that continued in the Shuttle–Mir Program. The US and Soviet commanders, Stafford and Leonov became lasting friends. Leonov is the godfather of Stafford's younger children. A minor planet, 2228 Soyuz-Apollo, discovered in 1977 by Soviet astronomer Nikolai Stepanovich Chernykh, is named after the mission. The Apollo Command Module from the mission is on display at the California Science Center in Los Angeles. The descent module of Soyuz 19 is on display at the RKK Energiya museum in Korolyov, Moscow Oblast, Russia. A display at the National Air and Space Museum in Washington, D.C. shows the docked Apollo/Soyuz configuration with the restored Apollo Command and Service Module used for testing prior to the mission, the back-up Docking Module, and a model of the Soyuz spacecraft. An identical Soyuz model is exhibited at the Kennedy Space Center Visitor Complex. A full-size mockup of the two docked spacecraft is located at the Cosmosphere in Hutchinson, Kansas. The US Postal Service issued the Apollo–Soyuz commemorative stamps, honoring the United States–Soviet link up in space, on July 15, 1975, the day of the launch. The remaining crew's most recent reunion was on July 16, 2010, when Leonov, Kubasov, Stafford, and Brand met at an Omega timepiece store in New York City. All except Leonov participated in a public roundtable that evening. Omega had produced several watches to be used on the mission. In the wake of the mission, a large Apollo–Soyuz monument was constructed outside TsUP (the Soviet, later Russian space control center) in Moscow. It consisted of a metal Earth overarched by an arc terminating in a scale model of the joined Apollo–Soyuz spacecraft. It was damaged when a vehicle collided with it in the late 1990s, and was removed for repairs. The mission control room that hosted the Americans in Korolyov, Russia was preserved in memorial of Apollo-Soyuz. The United States spent $245 million on Apollo–Soyuz, or $1 billion in 2010 inflation-adjusted dollars. In the non-canonical Superman #300 comic book, the Apollo–Soyuz astronauts and cosmonauts are the first to spot an unidentified flying object (Kal-El's spacecraft) approaching Earth, then the US and the USSR race to the capsule to take it in their nation. The 2009 film Night at the Museum: Battle of the Smithsonian features the Apollo–Soyuz display conserved at the National Air & Space Museum. In 2013, the Apollo–Soyuz Test Project was discussed in the pilot episode of the FX show The Americans, with Stafford being portrayed by an extra. The 2017 film Valerian and the City of a Thousand Planets features the Apollo–Soyuz Test Project in its opening credits, accompanied by David Bowie's "Space Oddity". Interkosmos, a Soviet space program from 1967 to 1994, designed to give foreign nations access to space missions. ^ Samuels, Richard J., ed. (December 21, 2005). Encyclopedia of United States National Security (1st ed.). SAGE Publications. p. 669. ISBN 978-0-7619-2927-7. Most observers felt that the U.S. moon landing ended the space race with a decisive American victory. […] The formal end of the space race occurred with the 1975 joint Apollo-Soyuz mission, in which U.S. and Soviet spacecraft docked, or joined, in orbit while their crews visited one another's craft and performed joint scientific experiments. ^ a b c d e f g h Committee on Aeronautical and Space Sciences, Soviet Space Programs, 1971–75. Washington: U.S. Govt. Print. Off., 1976. ^ "The First Dryden-Blagonravov Agreement - 1962". NASA History Series. NASA. Retrieved March 14, 2019. ^ Ezell, Edward; Ezell, Linda (1978). "Foreword". The Partnership: A History of the Apollo-Soyuz Test Project. Washington, D.C.: NASA. ^ Ezell, Edward; Ezell, Linda (1978). "Chapter 5. Proposal for a Test Flight". The Partnership: A History of the Apollo-Soyuz Test Project. Washington, D.C.: NASA. ^ a b Jennifer Ross-Nazzal,"Détente on Earth and in Space: The Apollo-Soyuz Test Project," Organization of American Historians Magazine of History, September 2010, Volume 24, Issue 3, pp. 29 – 34. ^ Agreement Concerning Cooperation in the Exploration and Use of Outer Space for Peaceful Purposes: Moscow, 24 May 1972. Moscow: NASA, 1972. ^ Slayton, Donald; Cassutt, Michael (1994). Deke! U.S. Manned Space: From Mercury to the Shuttle. New York: Forge. pp. 278–279. ISBN 0-312-85503-6. LCCN 94-2463. OCLC 29845663. ^ Jones, Phillip. "Blast-off to Bognor". Retrieved May 4, 2011. ^ Edward Clinton Ezell; Linda Neuman Ezell (1978). "The Partnership: A History of the Apollo-Soyuz Test Project". NASA. Archived from the original on May 24, 2011. Retrieved May 4, 2011. ^ Saxon, Wolfgang (March 23, 1996). "Jane Oppenheimer Dies at 84; Expert on Embryos and Space" – via NYTimes.com. ^ Ezell, Edward Clinton; Ezell, Linda Neuman (1978). "The Partnership: A History of the Apollo–Soyuz Test Project". NASA History Series. NASA (NASA Special Publication-4209). Archived from the original on August 23, 2007. Retrieved March 17, 2009. ^ U.S.-Soviet Cooperation in Space (PDF) (Report). US Congress, Office of Technology Assessment. July 1985. pp. 80–81. Retrieved June 13, 2018. ^ a b Kellie Morgan (July 15, 2015). "How historic handshake in space brought superpowers closer". CNN. Retrieved June 13, 2018. ^ James Moltz. The Politics of Space Security: Strategic Restraint and the Pursuit of National Interests. Stanford University Press. p. 181. ISBN 978-0-8047-7858-9. ^ a b "Apollo–Soyuz: A cold war handshake in space, 40 years on". New Scientist. July 17, 2015. Retrieved June 13, 2018. ^ Schmadel, Lutz D. (2003). Dictionary of Minor Planet Names (5th ed.). New York: Springer Verlag. p. 181. ISBN 3-540-00238-3. ^ First International Space Crew Reunites for Mission's 35th Anniversary. Space.com. Retrieved on 2012-08-04. ^ Lafleur, Claude (March 8, 2010). "Costs of US piloted programs". The Space Review. Retrieved February 18, 2012. Wikimedia Commons has media related to Apollo-Soyuz Test Project. «Apollo-Soyuz» – tell Soviet scientists, engineers and astronauts – participants of the joint work of American specialists, Politizdat 1976, with a circulation of 100 000 copies.